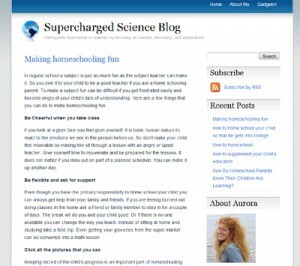 Get the latest tips and news from Supercharged Science through our Homeschooling Blog! We’ve posted articles about how to homeschool your child so that they get into college, how to supplement your child’s education, how to figure out if your child is really learning, how to make homeschooling fun, and more. You’ll find new articles here every few days… it’s just one of the ways we stay in touch. If there’s something you’d like us to write about, just drop us a note – we’d love to hear from you about what you’d like to read about!